Capital expenditure (Capex) on global liquefied natural gas (LNG) facilities is expected to total $259 billion over the forecast period 2015-2019, according to the new ninth edition of Douglas-Westwood’s (DW) World LNG Market Forecast 2015-2019, which predicts investments to be 88% larger than during the previous five-year period. Report author, Amanda Tay, commented, “Global LNG Capex witnessed a slowdown in the period 2009 through to 2012, as a result of the global recession. Post-2012, alongside stronger confidence in the global economy and a growing appetite for energy, the industry started picking up and has piqued investors’ interest in LNG projects again. Events such as the shale gas revolution in North America and Japan’s emergency reliance on LNG, subsequent to the Fukushima incident, have all played and will play a part in shaping the LNG sector. “Australasia and Asia have dominated Global LNG Capex in recent years, however, over the forecast period all the regions are expected to experience positive growth in Capex, except for Australasia and the Middle East. With its ambitious plans to export LNG, DW expects North America to be a significant market player in the forecast period. Asia is set to slightly increase its market share to 32% of investments in the forecast period, largely from regasification/import projects in China, Indonesia and Japan, as a result of increasing appetite for energy. 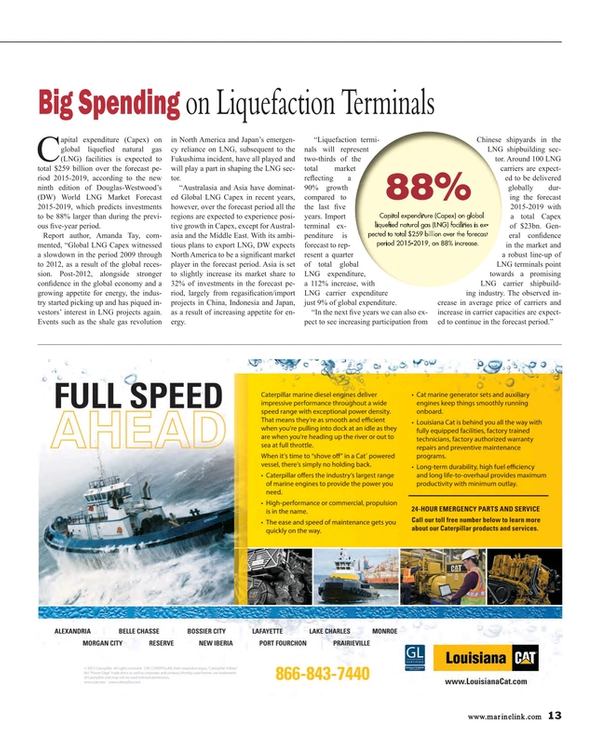 “Liquefaction terminals will represent two-thirds of the total market reflecting a 90% growth compared to the last five years. Import terminal expenditure is forecast to represent a quarter of total global LNG expenditure, a 112% increase, with LNG carrier expenditure just 9% of global expenditure.